A joke for nerds: if you want to survive in the end of the world, started by robots, just close the door. Robots have done a lot of things - accuracy, speed, constancy - but still can not cope with door handles, and other simple things. Part of the problem is that they have to move around the world created for people and for human hands. And the hand is one of the most complex mechanical structures of nature. However, soon the cars, apparently, can and this. Researchers from the University of Pisa and the Italian Institute of Technology have developed an amazingly simple, and stunningly dexterous robot, known as SoftHand ? which operates with just two motors. 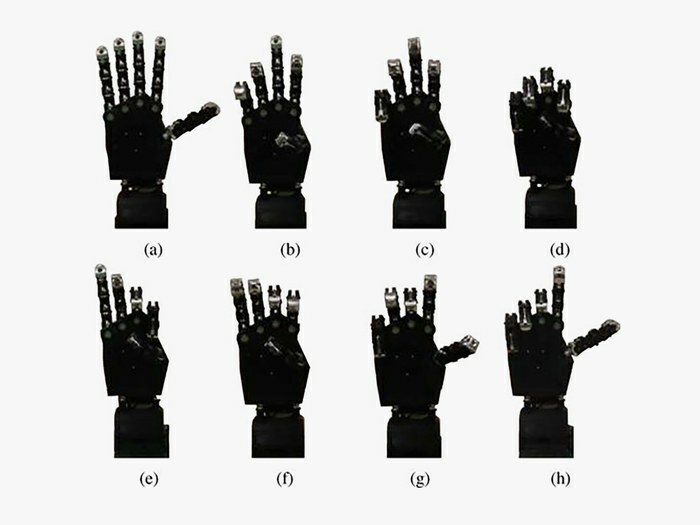 Compare with the hand Shadow Dexterous Hand, hypnotically dexterous, but working from 20 motors. SoftHand promises robots that soon they will be captured, and much cheaper. Like other robots, SoftHand uses tendons in the form of cables pulling their fingers together. But they are completely different. Instead of a pile of ropes stretched to each finger, there is only one in the hand, wriggling over the multitude of blocks located in each finger. Dexterity is slightly less, but it greatly cuts cost and power consumption. And this is normal - there is no single universal technology suitable for all robotic manipulators. In certain cases, the application will find even more complex robots - as it will be found by SoftHand. 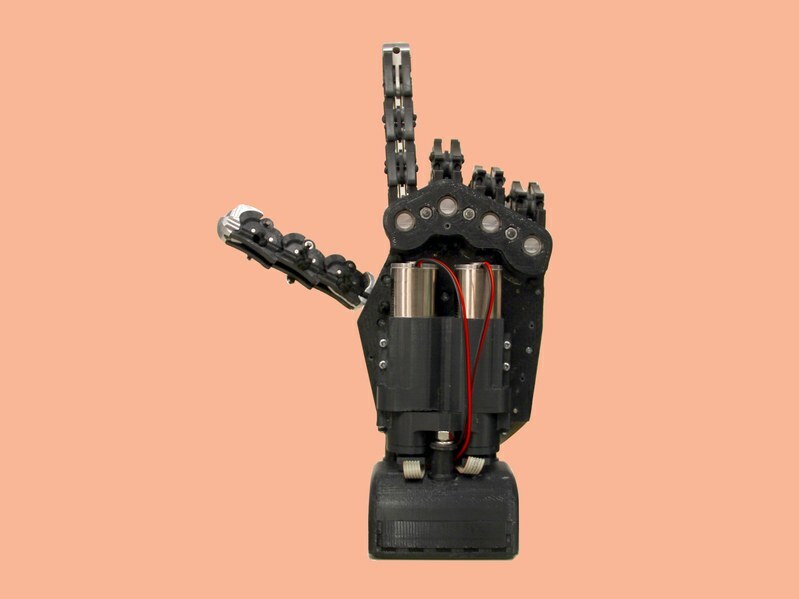 To create a hand, researchers first created a simpler version of SoftHand with only one motor. "The idea is that when you turn on the motor, the length of the cable decreases, which makes it compress the grip," says Robototenik Cosima Della Santina, who helped design the system. Release the tendon, and your fingers again straighten into the open palm, thanks to the elasticity of the joints. This works great when you, for example, need to grab a ball. But as the fingers move synchronously, more subtle manipulations of the hand are unavailable. Adding a second motor significantly increases the dexterity of SoftHand 2. Look at the image above. Each end of the cable, still curling through all the fingers, is connected to one of the two motors located in the wrist. If you start the motors in one direction, the cable is shortened and gestures are obtained from the upper row, A, B, C and D - according to the same principle as SoftHand. But if you start the motors in different directions, you get something more complicated - E, F, G and H. In this case, one motor releases the cable, and the other chooses. "When the rope moves along a lot of blocks, the tension of the rope does not remain constant," says Della Santina. If the cable draws one motor, the tension at the end nearest it will be greater. If another motor releases the cable, the end tension will be less at its end. Playing with tension in this way, you can work with SoftHand with a much smaller number of cables than is normally used in robots, and still make your fingers move. Look at the above animation, and you will see the difference that the second motor brings. On the left hand a single motor, on the right - there are already two. The first works at full, squeezing all the fingers around the ball. The second can be operated with fingers selectively, due to the difference in the tension of the cable. The same principle applies to the capture of a banknote. Given the presence of only two motors, SoftHand can use an impressive set of maneuvers. She can pull out her index finger to flip the latch, or move a sheet off the table. It can even unscrew the lid from the can. And all this is relatively inexpensive. After all, the more motors, the more expensive it is. "For robots to learn and do all kinds of cool things, we need inexpensive, reliable and complex systems," says robot technician Lerrell Pinto of Carnegie Mellon University, who develops robot manipulators. "I think that this hand offers an excellent compromise," he adds, but a real test is the search for a real use of such a hand. "Can I use it for offline learning? How reliable is it, will it sustain thousands of seizures? There are no answers to these questions. " SoftHand is a promising project, but more complex robotic manipulators, like Shadow Dexterous Hand, still have something to offer. SoftHand can do pretty well with stereotyped behavior, such as loosening the lids in cans, and Shadow with many of its motors can better adapt for complex tasks. And SoftHand will easily cope with the greeting on the cams. 01/09/2018 The Senate does not want robots to be distracted by beer. And about what else to write on Friday?